August is the month of independence from colonial rule in India. 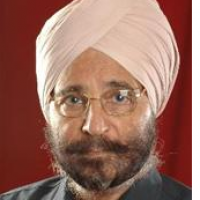 For this month our guest author is one of the most influential ophthalmologists from India: DR DALJIT SINGH. Born on 11th October 1934, he obtained his MBBS from the Government Medical College, Amritsar in 1956. He served as a member of faculty of the Government Medical colleges in Amritsar and Patiala for 23 years and became an Emeritus professor of these institutions. The Government of India awarded him the fourth highest civilian award of Padma Shri in 1987. Seven years later, he received the Dr. B. C. Roy Award, the highest Indian medical award from the Medical Council of India. At 82 years of age he remains as passionate as ever in writing and clinical work. This article traces his long journey in glaucoma surgery. "The Glog" is honored to have him here as a guest author. Our deepest thanks to him for sharing his thoughts. I did my first glaucoma surgery in 1957 -Elliot trephine. In those days no conjunctival sutures were applied - the limbus based conjunctival flap was replaced and patted with a swab stick. In 1903, Elliot did the first such operation. Till 1957, nothing much had changed in the technique or the instruments. The conjunctival flap was cut with a blunt conjunctival scissors. The bleeders were touched with a hot copper probe. The Tenon capsule was pushed to the limbus with Took’s knife.A manual trephine was used at the limbus to make a hole, through which iridectomy was done. Antibiotics appeared in late forties and steroids in fifties. Anesthesia was cocaine as local drops and novocaine for facial block and retrobulbar injection. In fifties, the other operation was “broad basal iridectomy”, which worked for acute glaucoma. Schiotz tonometer was the guide. A dial tonometer was also available. The average age in India was 37 at the time of partition in 1947. Literacy rate was 11 %. Road connectivity was very poor; bus services for the villages were non-existent. Most roads were mud roads. There was no electricity in most of the villages. Most of the villages had no medical doctor. Telephone services were very poor. To ring up some one in the adjoining city, one had to go to the main office in the city and wait for a connection for hours. Most people came to the hospital by horse driven tonga, by foot or a bicycle and a few on a newly introduced human driven rickshaw. The number of eye surgeons was very small. 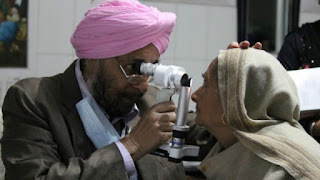 In my State of Punjab, before 1966 (when it was subdivided in to three) an area of about 150000 sq.Km, there were less than a dozen “Eye surgeons”, many of them were qualified. Cataract surgery was done through a large 180 degree incision made with a Graefe knife. The cataract was removed with a forceps or by Smith Indian tumbling technique. Most cataract surgery was done through eye camps in large villages away from the city. No suture was applied. The patient was kept in the hospital for 7 days. In my institution, one limbal suture was started in the middle of 1957. The suture was 6 zero and the corneal forceps was crude and looked more like today’s superior rectus forceps. The suture was removed on 7th day. In fifties, glaucoma was not such a big problem for the eye departments. Not many patients reached glaucoma age. Most patients came in absolute glaucoma stage. Less advanced cases received pilocarpine drops 1 %, 2 % or 4 %. The other medicine was physostigmine ointment 1/2 % (anti choline esterase). Iridencleisis surgery attracted the ophthalmologists, since it was easier to do. For obvious reasons, few patients came for follow up. Then came the scleral punch operation and a host of others. In sixties came trabeculectomy that became the “gold standard”. Now socio-economic conditions have changed. Literacy rate is over 65 %. Every village is connected by metalled road, has electricity and primary health centers are aplenty. Two wheeler petrol driven, cars and taxis are common mode of travel. Everybody has a mobile phone. There are now 10 Medical Colleges and around 300 well equipped private and charitable eye hospitals in the now truncated state (partitioned in to three states in 1966). Indian pharmaceutical industry provides medicine of every kind at an “affordable to many” price. While Indian ophthalmologists perform over 4 million cataract operations with IOL implant, such enthusiasm is not reflected in the field of glaucoma. While we have an estimated 14-15 million glaucoma patients in India and there is an addition of 400000 every year, the number of glaucoma operations performed per year is perhaps (exact figures not available) much less than 50000. All glaucoma patients are “backlogs”. that keeps increasing. A lot of local as well as oral anti glaucoma medicines are available and so are a number of “costly” diagnostic tests. But there is great hesitation in performing glaucoma surgery. There could be many reasons - lack of glaucoma surgery training, fear of complications and failure after “gold standard” trabeculectomy operation. Most glaucoma patients are economically down, due to age, loss of job, have to buy medicines and come for check up on a regular basis. When you count the expenses, they become considerable. All pre-trabeculectomy era operations involved a direct approach to the anterior chamber at the limbus and were quite successful. The objection was raised about big blebs and cases of hypotony. Pre-antibiotic era trephine blebs were sometimes prone to infections. Even today, thin leaking blebs are prone to infection, as always. Trabeculectomy came as a new technique, in which direct approach to the anterior chamber was abolished. A large partial thickness scleral flap was dissected towards the limbus, which was followed by removing a large piece of deeper layers of sclera and limbus. This piece carried with it cornel-scleral trabeculae, hence the term trabeculectomy. In 1976, I gave a thesis to my PG on trabeculectomy. The removed piece was sent for histopathology, which did not show the trabeculae. 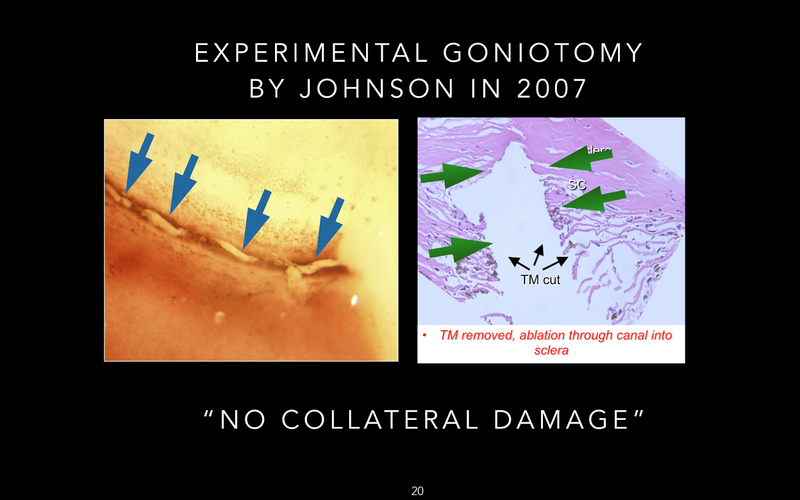 Gonioscopy showed that the opening was pre-trabecular. The IOP was controlled. I changed the thesis to Pre-trabecular filtration. It avoided the pathological area and opened in the clear cornea. The technique was like this: A limbus based conjunctival flap, a triangular half thickness scleral flap carried in to the limbus and cornea, A 1.5 mm square piece of deeper corneal tissue was removed, peripheral iridectomy was done. One suture was applied to the apex of the triangular scleral flap such that the flap did not shut completely. This was done by displacing its passage small distance away from the apex, which raised the edge of the flap on one side, thus facilitating the flow of aqueous. The conjunctiva was sutured back. 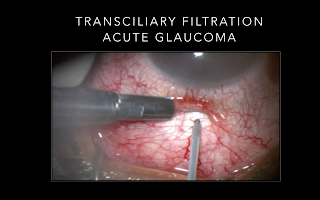 Pretrabecular filtration gave good results and a number of eye surgeons in Punjab picked up this technique. I presented Pretrabecular filtration at OSUK in London in 1978. The meeting started at 8 AM sharp. There was a tea break around 1 PM, where one cup of tea was served with a biscuit. No trade exhibition. In this meeting one speaker talked about a vitrector design and how it had been inspired by Concorde (supersonic plane) designers. Those were the days when no vitrectomy machine was available. Intracapsular cataract surgery after a 180 degree incision was the order of the day the world over. A number of patients suffered from unmanaged vitreous disturbance/prolapse. Aphakic glaucoma was common which rarely responded to cyclodialysis operation. Flat anterior chamber and malignant glaucoma were common and so were painful semi-blind or full blind eyes. Their treatment was really difficult. I thought of doing a “Transciliary Filtration”. A limbus based conjunctival flap was made, A 1.5- 2 mm scleral window was made in over the ciliary body, 2.5 mm from the limbus. The ciliary body that became visible was burnt with a hot copper probe, when vitreous started flowing, which was mopped with a swab stick. A cyclodialysis spatula was passed from the hole in the ciliary body, then through the pupil and the iris was pushed posteriorly to deepen the anterior chamber. Air was injected in the AC. Vitreous was sacrificed till it stopped coming out, so that the eye was soft. The conjunctiva was replaced. This operation helped many patients. I presented “Transciliary Filtration for Intractable Glaucoma” to OSUK, Birmingham 1979. In these times revolutionary “extracapsular surgery” was being perfected in Holland along with pupil supported intraocular lens. In 1979, after Birmingham meeting, I had the good fortune to visit Dr.Jan Worst in Groningen, who taught me his way of extra-capsular surgery and implantation of Medallion Lens. He gave me the first peep of “iris claw lens”, the vitreous anatomy (his book is “Anatomy of the Invisible”), keratoprosthesis and the use of stainless sutures. He liked my idea of Pre-trabecular filtration. Jan Worst had designed goniotomy operation for congenital glaucoma. He had designed many kinds of operating gonio lenses. It was a turning point in my surgery. I stopped doing intracapsular cataract surgery and did extra capsular surgery in every case. Vitreous complications were minimised and so were the cases of aphakic glaucoma. In 1980 I visited Dr.Hampton Roy in Little Rock,Arkansas for 2 weeks. He showed me pupil supported IOLs after phakoemulsification that he had learnt from Kelman many years before. With hindsight one can say that ECCE and Phako surgery have nearly removed the load of complicated aphakic glaucomas, all over the world. I started iris claw lens implantation after visiting Jan Worst. My team has done over 150000 iris claw lens implantations. In 1982 I went to ICO meeting in SanFrancisco from where I purchased a hand-held, battery operated, relatively thick disposable vitrector and a Swiss made electric operated fine electric operated vitrector. These instruments improved my vitreous management in aphakic glaucoma cases. In 1977 my student Dr.Arun Verma had a thesis “Failure after glaucoma surgery”. 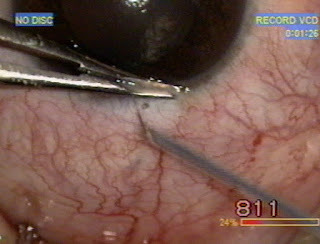 He found three main causes - internal blockage with iris, closure of the filtering track and sub-conjunctival scarring. In 1984, I was wondering about the common failure after trabeculectomy operation (may be only failed cases operated elsewhere came to me) and some of my own pre-trabecular filtration cases. Why had we abandoned direct filtration from the anterior chamber ? The standard answer was- it reduced the rate of flat anterior chamber and the scleral flap saved the eyes from infection. The reduction of the flap anterior chamber was at the cost of increased failure to control the IOP. It is well known that the trab scleral flap is sealed with three sutures. If and when the flap heals, the failure is close. Now a days you have secondary procedures like suture lysis with laser or breaking it with a needle, and subconjunctival injection of anti mitotic agents. Some of the procedures are repeated. The results of the procedures are not predictable. The prevention of bleb/intraocular infection with scleral flap needs scrutiny. A bleb is formed because some aqueous is leaking from under the flap. To reach the inside of the eye, the bacteria have to cross the conjunctival barrier, cause blebitis and then cross the track under the scleral flap. The weak point for infection is a thin conjunctiva of the bleb, which can crack/leak and let the bacteria in. During surgery, the more we dissect, cauterise the sclera and apply mitomycin C, the more we weaken the conjunctiva. Dissection and cautery encourage sub-conjunctival scarring. In 1984 I thought that we could prevent over filtration and hypotony that were a problem with trephine operation, by reducing the diameter of the trephine. Trephine was a manual instrument which was not easily handled by many surgeons. We could make a motorised trephine, using a 22 gauge steel pipe taken from an injection needle. 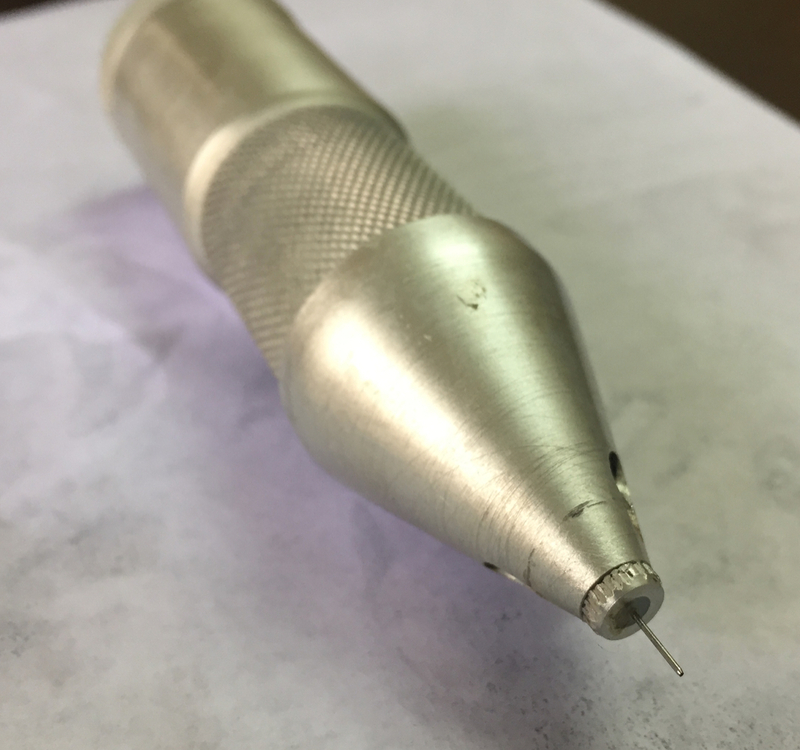 It produced a trephine track of 0.4 mm. I got a motorised trephine made from a battery operated egg beater. Thus came “Motorised Microtrephine for Glaucoma Surgery” which I presented at ICO Rome 1986. The meeting was held a few days after Chernobyl nuclear accident in Ukraine. The steps of operation are as follows: The conjunctiva is detached from the limbus for about 3-4 mm and is nicked posteriorly at one end. Wait for the bleeders to stop. Apply micro-trephine at the surgical limbus and press the switch. A trephine hole is created in no time. As the trephine is withdrawn, the iris might follow it, where it is caught, pulled and cut. At other times the iris is pulled out with a thin iris forceps. Irrigation is done and an air bubble injected. The conjunctival flap is pulled towards the nicked end and one suture is applied. The procedure caused little trauma to the tissues, consumed little time to perform and the results were good. Motorised Microtrephine remained my mainstay till 1993 . The main objection raised by the colleagues was that a direct filtration is liable to cause infection. However I did not encounter an infection. I had no explanation except that the small conjunctival flap was healthy. We tried to manage about a score of difficult failed glaucoma surgery cases, with glaucoma valve. We had a sad experience in that barring two cases, all of them failed in less than a year. We also treated about 3 dozen cases with ECP (enodcyclophotocoagulation), but the results were not good. We used cyclocryo only for painful blind eyes. A lot of painful blind eyes have been and still treated with injection absolute alcohol. There was a great pressure to buy SLT laser, which we did not buy. You know how this modality has fared. In 1993 I got interested in erbium laser, MEL 29 made by Meditec, Germany. There was a 300 micron optical fibre that was covered with a metal tube. Erbium laser was absorbed by the water in the tissues where it caused a mini explosion and thus cleared the way. It caused bleeding where blood vessels existed. I used it for Transciliary Filtration in a case of keratoprosthesis with glaucoma. For other glaucoma cases, the surgery was done after making a conjunctival flap. The scleral flap was made with it and so was the opening in to the anterior chamber. I also used it to make a trans-conjunctival limbal track in to the anterior chamber. For this purpose I was assisted by a highly talented mechanic Mr.Bidar, who prepared a tiny device for me that pushed the conjunctiva towards the limbus, which at the same time pressed the conjunctiva with a 2 mm round metal plate that had a hole about 200 microns, through which I applied erbium laser at the limbus and achieved in making a microtrack. The erbium laser optical fibres were very delicate as well as costly. I had to buy new ones very frequently. I would have loved to carry on with making trans-conjunctival filtration tracks, but for the fact that the company stopped supplying the fibres as well as doing service to the machine. In 1997, I went back to motorised micro trephine. Fig 3. Erbium laser in use. Bidar’s device helps in pushing the conjunctiva and a hole for the passage of erbium laser beam. In 1998, I was invited to John Sheets lecture lasting 45 minutes, on the topic of Congenital Cataract, at American College of Eye Surgeons. In the same session, Richard Fugo presented his revolutionary plasma tool, the Fugo Blade. His videos showed metal filaments cutting through animal eyes in a variety of ways, doing capsulotomy, iridectomy , vitrectomy, cutting the sclera partial or full thickness and making holes in the sclera. It all looked like a magic. The cutting was instant, without any burning or charring. At the end of the session, I caught hold of Dr.Richard Fugo and congratulated him for his achievement, and also expressed my desire of working with him. I said that his tool was a magic that could equalise the quality of surgery in the periphery/remote areas of third world countries to their best institutions and that it had endless possibilities.The communication was through fax. Next month I sent my ophthalmologist son Ravijit to him, where he used Fugo blade on animal eyes. Coming home he told me that Fugo blade indeed cut like no other device could. In July 1998, I did capsulotomies in 30 cataract cases, presented my data to FDA, which approved Fugo blade for intraocular use. It is the only electro-surgical device that has been approved by FDA, for intraocular use. In 1999 I presented my paper in a meeting organised by Dr. John Alpar in Hungary. It covered only the experimental and human capsulotomy. The awful cutting properties of Fugo blade, made me very cautious about its use. In the beginning I used it for capsulotomy in paediatric cataract. Most surgeons avoided doing surgery on congenital cataract, whereas I operated on 1-3 cases every day. A good large capsulotomy made surgery very easy and efficient, especially in the removal of cortex.One could do excellent capsulotomy in subluxated/ dislocated lenses, since with Fugo blade tip in action, the lens did not move at all. I had been using iris claw lenses in paediatric cataract since 1980.I also operated on pterygium cases. One day I got a case with acute phakomorphic glaucoma. I thought of my old transciliary filtration technique of 1979. In this patient I used a 300 micron Fugo blade tip to make a trans-conjunctival trans-scleral trans-ciliary track in to the posterior chamber. It worked like a charm. I studied the anatomy of the angle, the ciliary body and the posterior chamber from all available sources, to explore the feasibility of posterior chamber drainage in selected cases. I was heartened to find out that such a possibility existed. The volume of the triangular posterior chamber was about 160 cubic mm and the lateral wall was over 1.5 mm. I started doing Transciliary Filtration (TCF) in cases of painful absolute glaucoma, pupil block glaucoma and neo-vascular glaucoma. The technique was as follows: The sclera was dented by pressure about 1.5mm from the limbus with a blunt hockey stick knife. A blunt crystal blade (purposely blunted diamond knife or a sapphire knife) was used to push the conjunctiva up to the dented sclera and kept the pressure so that the conjunctiva shall not slip. A 500 or 600 micron Fugo blade tip was used at the highest energy setting.The tissues besides the blunt crystal blade were touched momentarily with the activated tip and lifted. The conjunctiva and scleral tissues disappeared with every application. When the ciliary body became visible, the direction of the activated tip was changed by 45 degrees and directed towards the posterior chamber. As the tip reached the posterior chamber, the fluid rushed out. An air bubble injected with a 22 gauge cannula passed through the pupil in to the anterior chamber. No iridectomy was done. 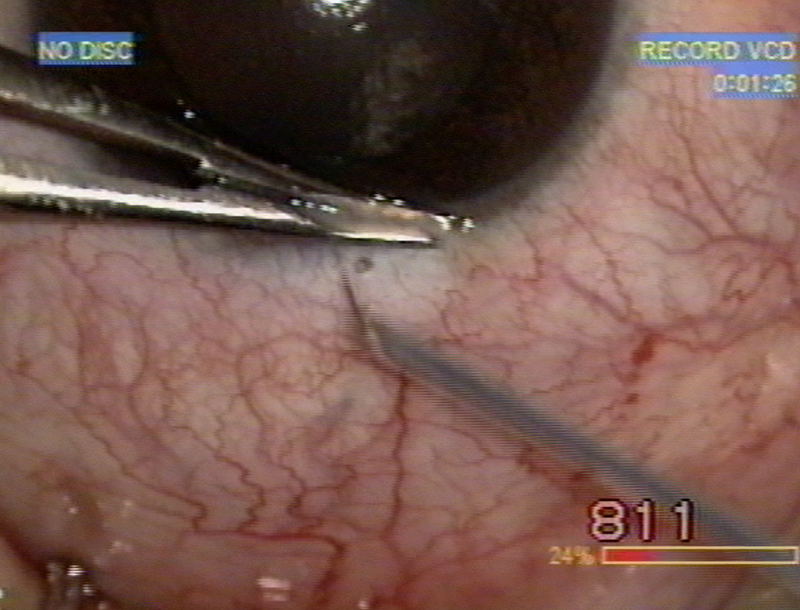 The conjunctiva retracted and ballooned when the crystal knife was lifted. 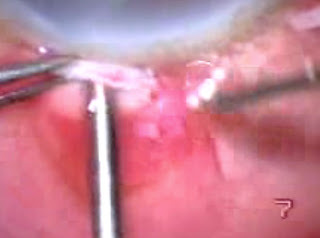 The conjunctival hole was closed with one suture. The eye was closed with surgical tape and a shield applied. The eye was examined after 4 hours. In every case the anterior chamber was formed. Hyphaema, slight to moderate was seen in every case of neo-vascular glaucoma. This hyphaema did not prevent filtration from the posterior chamber. Encouraged, I started doing TCF in every case of glaucoma. There was success in about 75% of primary surgery cases. I keep seeing some of those cases operated over a decade back. To raise the conjunctiva I often injected lignocaine under it. One day I injected fluid at 11 O’ clock and instantly noticed a transparent vessel getting filled up at 1 O’ clock and beyond. “Lymphatics” I exclaimed. Serendipity. Lymphatics had never been taught to us. It was written in the Ocular physiology books of the time that there are no lymphatics in the eye and the orbit. Even today large textbooks on glaucoma do not mention lymphatics. A surprise. I started looking for lymphatics in earnest. In the outpatients, I soon found the existence of lymphatics at the limbus. They entered the cornea singly while proximally they divided and joined each other, finally merging with the conjunctival lymphatics. The presence of pigment close to the limbus highlighted the lymphatics. Cases of trauma showed the presence of blood in channels that were neither arteries nor veins, therefore must be the lymphatics. My thinking led me to many directions. Blood under the conjunctiva can not return to the venous end of the capillaries. If there were no lymphatics the blood would stay and lead to breakdown products. It would take a long time for it to disappear. Only the lymphatics had the capacity to draw in the blood particles and return them to the circulation. The same argument could be applied to the orbit. We have seen massive retrobulbar haemorrhages reduced within hours and disappear in matter of days. This God gift could only be due to the flood drains that are lymphatics. When they exist all over the body, why not in the eye and the orbit? Looking in to the literature, I could find the mention of lymphatics in a cursory manner. In some books one could see imaginary drawings of lymphatics making loops at the limbus. In Duane’s text book, there was even a histological picture of lymphatic vessel. No function was seriously assigned to the lymphatics. There was no reference to the possibility of lymphatics being connected to the drainage of aqueous humour. Inside the operation theatre, I looked at the eyes carefully by twisting the conjunctiva close to the limbus. i could see multiple lymphatics running parallel to the limbus. Whenever there was bleeding caused by injury to the conjunctiva or to the limbus, I could immediately trace the movement of the blood to the nearest channels that could be nothing else but lymphatics. For further demonstration of lymphatics I injected trepan blue at the limbus with a 27 gauge needle. 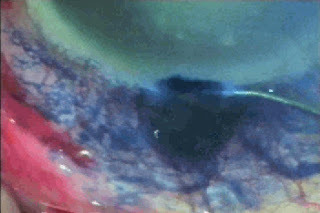 The dye entered the limbal and conjunctival lymphatics. At times extensive network of conjunctival lymphatics could be charged. In one case the dye injected at the limbus also outlined for some distance an arcuate channel in the place where one would expect the present of lucid interval in cases of arcus senilis. That raised a question for me - are the conjunctival lymphatics connect some kind of channels in the cornea? I came across a case of megalocornea who had slight opacification of the centre of the cornea. Under high magnification, it showed a network of what appeared to the channels. On optical section, the channels were in mid-stroma. I gave close attention to the patients with arcus senilis. They often showed network of channels, that seemed to connect to the lucid interval area (which I started imagining to be a channel). One of my patient, about 90 years of age had a complete network of channels in the cornea. She still visits me (now nearing 100). Looking to dozens of cases of corneal channels, i came to the conclusion that a semi-transparent area of the cornea shall show the corneal channels. Fig.5 A huge network of lymphatics is charted by injecting trepan blue at the limbus. Aqueous veins by comparison are very few and likely inadequate to carry out the function that we assign to them. Looking at how the fungal corneal ulcers spread in the form of a network in the central cornea and the lucid interval in a circular manner, these were further evidence of the existence of corneal channels. On optical section the lucid interval appeared triangular in shape the apex of which connected the central corneal channels. Meanwhile I had collected many beautiful pictures showing a lucid interval connected to the limbal lymphatics on one side and corneal channels on the other side. This proved the unity of corneal and conjunctival lymphatics. The question arose - the channels must be containing fluid that was on constant move. Where did this fluid come from ? I theorised that the fluid must come from the canal of Schlemm with every heart beat. It came to lucid interval from where a part was pushed towards the cornea and a part of it went to conjunctival lymphatics. But a physical proof was lacking. it came years later when I used OCT to study the angle, in cases of arcus senilis with prominent lucid interval. In many cases both the lucid interval and the canal of Schlemm got outlined. Sometimes a connecting link between the two was also seen (aqueduct of Singh). Remember we are dealing with the whole circumference of the limbus. In one case of angle closure glaucoma, the appearance of the OCT changed after using pilocarpine - canal of Schlemm and lucid interval canal as well as the aqueduct was seen. Now, I visualize the movement of aqueous as already explained above. The nutrition for the cornea comes mainly from Schlemm canal to lucid interval canal to the cornea channels. Corneal endothelium has important functions, but is most likely not responsible for filling and moving the aqueous inside the corneal network. 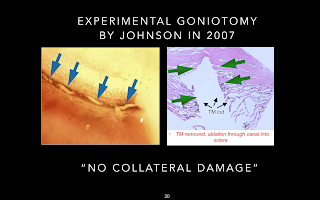 I presented my first paper on TCF and conjunctival lymphatics at American College of Eye Surgeons in 2001. The editor of glaucoma section of Review of ophthalmology took my interview and published his report on lymphatics in the next issue. In the coming years I presented papers, movies and posters on the lymphatics in ASCRS and AAO meetings. In May 2006, I presented TCF and another paper on Conjunctival lymphatics at International Congress of Glaucoma in Toronto. As I finished my well illustrated paper on lymphatics, the chairman of the session remarked thus: “Never heard of lymphatics. Now we go to the next paper.” I was shocked, but could do nothing. Here I met Dr.Johnson of Canada, the famous pathologist. He decided to histological studies with Fugo blade, which he did in the next 3 months. He demonstrated that Fugo blade cuts the angle tissues without any collateral damage to the adjoining tissues. In Toronto I got the news that my wife had 4th stage lung cancer. She died after 1 and half year. I never returned to the Americas. My next attempt to talk about my work outside India was in September 2012 at International Congress of Glaucoma Surgery, at Glasgow. Before they accepted my presentations, I had a lot of correspondence with Prof.Andre Mermoud, founder president and Prof Weinreb, past president. 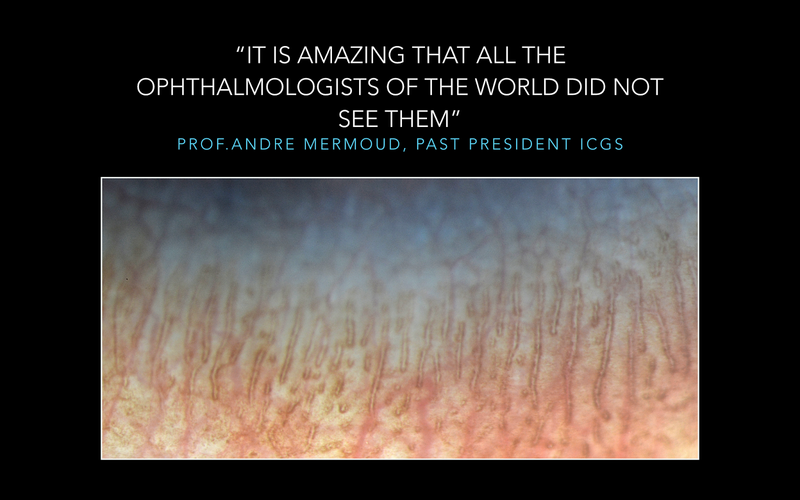 After going through my material Andre Mermoud wrote,” It is amazing that all the ophthalmologists had not seen them.” Prof. Weinreb wrote, “I had seen these structures but never connected. What the mind does not know, the eyes do not see.” At the Glasgow meeting I also met Allingham, the author of monumental book on Glaucoma (Bruce Shield's Textbook of Glaucoma). I told him that the book did not mention conjunctival lymphatics. Later I sent him all the material on lymphatics, but he did not reply. I also made presentations in Georgia (near Black Sea). Fig.6 Numerous lymphatics exit from the limbus in multiple layers. Throughout my research, it was most important to make high quality photographs of lymphatics. My photos slit lamp was Topcon. In the beginning I used Kodak 100 ASA color film on a Nikon camera and later on a 36 mega-pixel Nikon digital camera at the highest slit lamp magnification. The greatest pictures were the ones that showed multiple layers of corneal lymphatics entering the Lucid interval canal (Dr.Richard Fugo once said that if you can prove that it really is a canal, I shall call it Singh canal) and multiple layers of conjunctival lymphatics coming out of the limbal area. Such a huge network of lymphatics! By comparison aqueous veins are very few and therefore cannot match the draining capacity of the lymphatics. The cornea, the limbus and the conjunctiva have just the same interconnected lymphatics. Fig.7 My very first case of Microtrack Filtration. The Fugo blade tip 100 micron has just made a filtration track. The total surgery time is recorded as 1 minute 26 seconds. I occasionally did Microtrack Filtration in to the anterior chamber, using a 100 micron Fugo blade tip. Iridectomy was done through another incision, again with Fugo blade. I tried many combinations and permutations, but failure dogged me all the time. Dr.Ramesh Shah solved my problem. He used a 200 micron Fugo blade tip and did a manual iridectomy in line with the filtration track. He went on to making two tracks that further increased his success rate. I started following him and my results too improved. When I do MTF, I follow Dr.Ramesh Shah. Of late I have greatly reduced my surgery, due to old age and health problems. The success of filtration glaucoma surgery depends upon reducing surgical trauma to the minimum, mainly to protect the lymphatics of the conjunctiva. Absence of lymphatics invites scar formation. Nobody instinctively wishes to do surgery in a scarred area for the same reason. In all failed cases of glaucoma surgery, we try to find a virgin area. A huge variety of glaucoma exists - trauma, inflammation, neo-vascularization of the iris, tissue abnormalities in the anterior segment, post-VR surgery cases, where the conjunctiva all around the limbus has been scarred. In every case you have to design a specific way of doing surgery. Fugo blade is really handy in most of these cases. Failed trab., failed valves show extensive scarring and one has to find a virgin area to do TCF or MTF. Non-perforating glaucoma surgery: I have done only a few NPGS. The first case was a full term high myope pregnant patient whose IOP was not under control with all medicines. I thought that any kind of filtration surgery would be risky. Therefore I made a limbus based flap, ablated the sclera till the lateral wall of Schlemm canal was removed and fluid started started oozing. After 10 years she still has a good bleb and IOP is controlled. Another interesting example was a case of trauma with v high IOP, dislocated crystalline lens and vitreous in the anterior chamber. IOP was similarly uncontrolled and he had agonizing pain. NPGS was done to control the IOP and the lens extraction was done a few days later. NPGS has plenty of failure rates, the way it is normally done. I reserve it for selected cases where I do NPGS without a scleral flap. Fugo blade has plenty of uses beyond glaucoma surgery. All the uses have been included in a book “Ocular Applications of Fugo blade” published by Williams and Wilkins in 2010. There are many other ways of using a Fugo blade for glaucoma, than TCF and MTF. However, Fugo blade is merely a tool in the hands of an innovative surgeon, who finds his own way. Many techniques have changed since the book was published. The surgical time is important. TCF and MTF take about 5 minutes. There is little trauma to the tissues. In case of failure, redoing the surgery in an adjoining area is nearly as easy. In every case of failed MTF, gonioscopy should be done at the earliest. If there is an iris knuckle sticking in to the internal opening, it should be blown away with Nd:YAG. A failed TCF case can be re-operated at an adjoining area. Some other technique can be used, since the tissues are not disturbed. “The fluid passes through the wall of the bleb and gets mixed the tears”. I would consider this as leakage. “The fluid is absorbed by perivascular tissues”. The huge amount of out coming fluid cannot be “absorbed”. It has to be drained. In another place, a journal, a Japanese author suggested that the aqueous is absorbed by degenerated veins. I do not buy this. 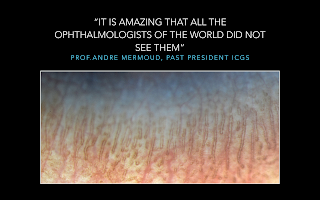 The simple way for the fluid to move is through the God given ample lymphatics in the ocular tissues. Whatever Glaucoma procedure you do, if you protect lymphatics and use them for aqueous drainage, there shall be greater chances of success. Before I end, I wish to write about Fugo blade. How is it that a revolutionary tool like it has yet to become popular? It is a versatile tool that can be used for practically every kind of surgery. The book “Ocular Applications of Fugo blade” explains all that. It was approved by FDA for TCF and Capsulotomy. It took very little time to perform. Many US ophthalmologists were interested in doing TCF, but did not move forward. Reason? A regulatory body kept the fee for TCF and ridiculously low, compared to trabeculectomy. So who would do it ? I am witness to Dr Fugo’s separate meeting with senior officials of three very reputed equipment makers. They all wanted to buy Fugo blade along with patents, while Dr Fugo only wanted to sell them the instrument, which could be an add on to the existing phako machines. The big companies put a variety of obstacles and litigations in the way of this small company, which did not have the capacity to reach individual ophthalmologists, world over. Result - the company has barely continued to survive for 17 years. The manufacturing cost keeps going up due to dollar value going down. The keen ophthalmologists outside US, especially in the third world are increasingly hard pressed, because their currencies keep falling against the weak dollar, thus raising the cost in local currency terms. The equipment is durable as I have experienced. The only little problem was the replacement of rechargeable cells after every 4- 5 years. Although the operating tips are disposable, but I keep using them after washing and ETO sterilisation. I have great interest in Fugo blade because my surgical techniques can not spread without it. I offer my equipment to ophthalmologists around me at no cost, on demand. Not many have availed of my offer. I have lost contact with Dr.Fugo for over one year.